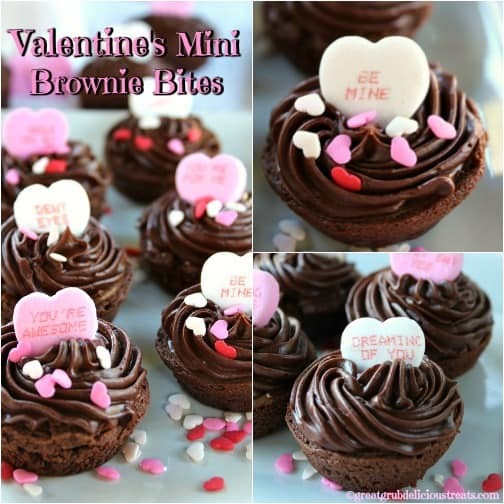 With Valentine’s Day quickly approaching, here are some Valentine’s mini brownie bites that are sure to put a smile on your face. Definitely a chocolate lover’s dream all in a bite size, tasty treat. And…. 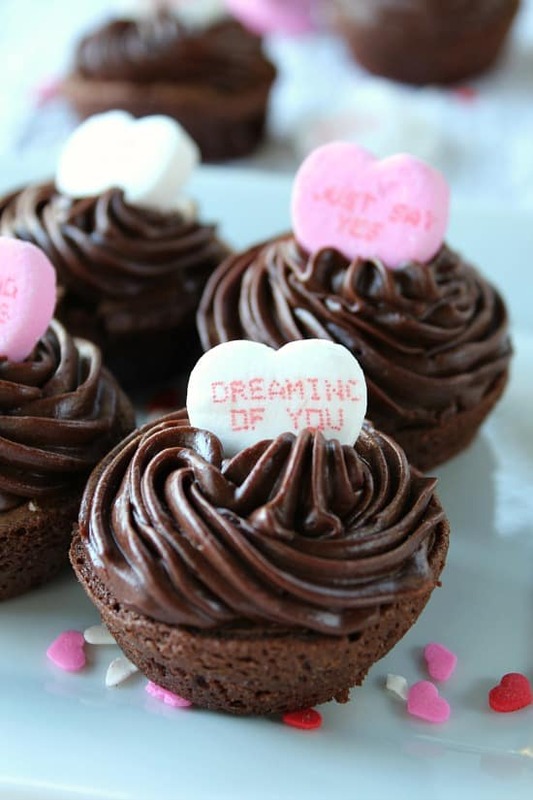 if you are a chocolate lover, these Valentine’s mini brownie bites are right up your alley. Chocolate is so delicious any way you eat it. 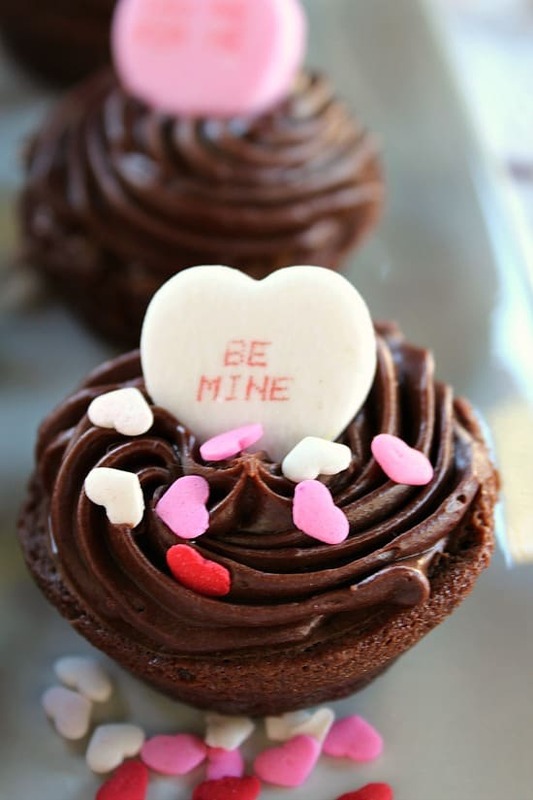 One of my favorite ways is in a brownie, so soft, chewy and delicious! Imagine biting into one of these babies and getting all that chocolate frosting all over your front teeth. Yep, it happens every time. 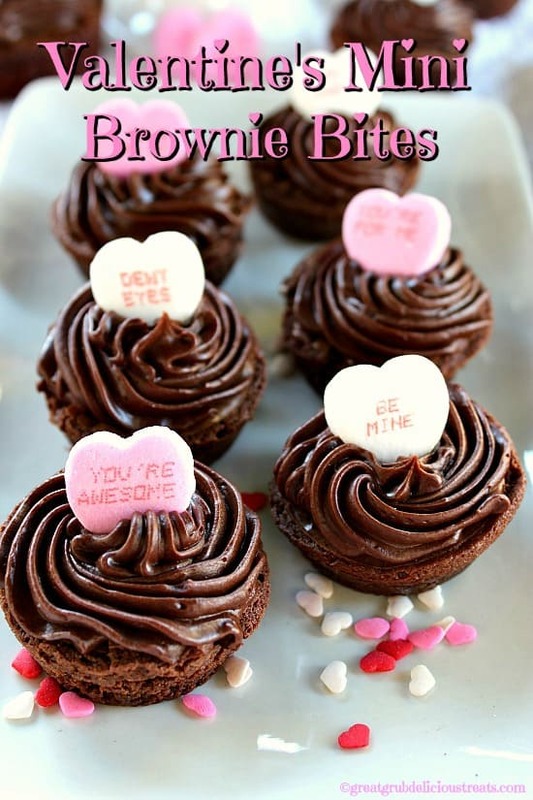 You can make these brownie bites in a pan and cut them into 1 inch squares if you don’t have a mini muffin pan. Or you can cut them into bigger squares if you are wanting to skip the “bite size” and just go for a larger piece of chocolaty heaven. Bite size anything is always a good thing. Less guilty, but not so much when you consume 5 or 6 at a time. One thing I like about the smaller size, I am always able to share lots more with my friends and family. 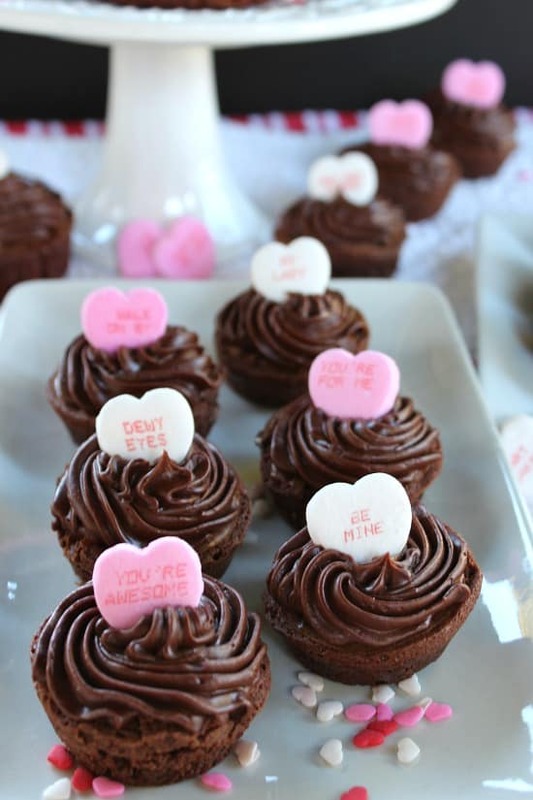 I brought these Valentine’s mini brownie bites to work last week and everyone loved them, along with my Valentine Sugar Cookies. So yummy! 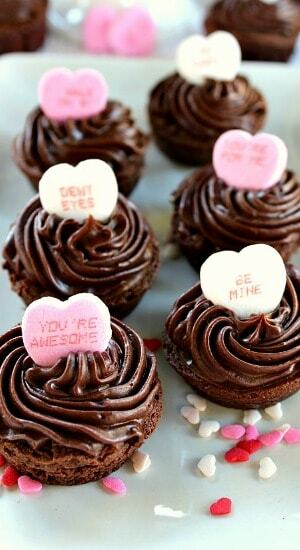 I’m sure you and your family will enjoy these tasty sweet treats too. 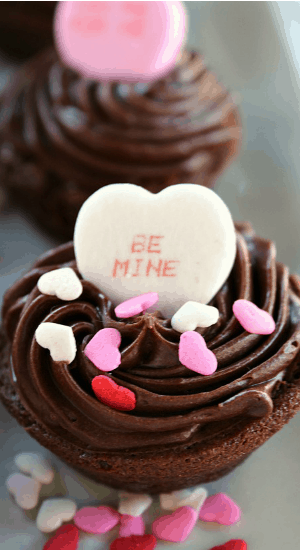 I hope you all have a wonderful Valentine’s Day! Preheat oven to 350° and spray mini muffin pans with non stick spray, set aside. In a small sauce pan, heat chocolate chips, butter and unsweetened cocoa powder over low heat until melted. Let cool. In a large mixing bowl, beat eggs and sugar until nice and fluffy, about 3 minutes. Add vanilla and beat until combined. Pour cooled chocolate mixture into sugar mixture. Stir until combined. Add flour and salt. Gently stir until combined. Pour into prepared mini muffin pans. Bake for approximately 10-14 minutes. Remove from oven and let cool completely before adding frosting. In a medium size mixing bowl, add melted butter. Mix in cocoa. Next add a little powder sugar and then milk, then powder sugar then milk. Repeat until all is well mixed. Mix on low speed. After frosting is well blended, add vanilla and stir. Frost brownie bites once they have cooled.